There’s one really great piece in Maximum Verbosity’s Tales from Wonderland at the new Phoenix Theater, and three others that are… not so great. One could be thankful that the really great piece, phillip andrew bennett low’s stage adaptation of Bruce Holland Rogers’ Lewis Carroll-infused short story “A Common Night,” is the piece that comes last, for they say if you end well, the audience will forgive you anything. Well, almost anything. One could also, unfortunately, despair by intermission that Lewis Carroll would ever prove stage worthy. I, for one, fall in the grateful camp. I also wish there’d been more time to develop Tales from Wonderland in the vein of “A Common Night.” If more of the evening had been theater inspired by Carroll and less reader’s theater trying to recite Carroll, Tales from Wonderland might have been more successful. Because “A Common Night” is brilliant stuff. Holland Rogers’ story is such a perfect fit for the wordsmithing style of low that I had to remind myself afterward by reading the program that it wasn’t low’s original work. It’s like the men are sharing the same brain. Kudos as well to low for not only writing and directing it but for turning in an impressive lead performance, too. He’s also to be commended for gathering a great team around him, from the actors with whom he shares the stage, to his backstage collaborators —Windy Bowlsby adding deliberately off-kilter choreography to the haunting off-key, aggressively dissonant ballad “Beautiful Dark” composed and music directed by Courtney McLean; and the vibrant and wacky costumes created by assistant director Elizabeth Byrd. Poetry professor Julian (low) must go from his students’ resistance to poems obsessed with death, to an emergency trip to the hospice to visit his unseen but ailing wife. Along the way he finds himself sidetracked into a darkly comic fantasia of oddities that would make Lewis Carroll and Alice In Wonderland proud. These include the not altogether welcoming tour guides in the form of candy stripers named Tweedledee (Kit Chambers) and Tweedledum (Missy Hildebrandt). This cheerful but menacing duo help orchestrate a lot of the strangeness that takes place in the corners of Julian’s mind. If there were a Most Valuable Player award in the cast, you’d have to give it to Ryan Bergman. He gets handed a variety of roles throughout the production, several just in “A Common Night,” and he takes the opportunity and runs with it. You can’t really call it scene-stealing when he fits in so seamlessly with the rest of the cast, but nonetheless he’s a stand-out. He goes from the Gnat in conversation with Alice in a more direct Carroll translation to stage, “Looking-Glass Insects,” to one of Julian’s poetry students, to a series of playing cards being executed in a variety of moods by the evil candy stripers, to the personification of Death itself, all decked out in surgeon’s garb but in shades of gray and black (again, Byrd’s costuming here really takes things up a notch). Bergman’s fellow ensemble members in “A Common Night” all turn in strong work—Aery Austin-Elbaz, Tamara Koltes and Daniel Vopava, in addition to the previously mentioned nasty nurses. It’s in part because “A Common Night” at the end of the evening is SO good that you wonder how everything sort of went off the rails for the hour prior to that. In addition to the “Looking-Glass Insects” piece with Alice and the Gnat, there’s another Alice in Wonderland-style encounter at the beginning of the evening where Alice (Austin-Elbaz again) meets up with “Humpty Dumpty” (Vopava again). Title character Mr. Dumpty kicks off the night with the Jabberwock poem and then banters with Alice before taking his inevitable plunge off the wall. Both the egg and the gnat are clever enough, and Alice gives them a good foil, but the pieces never really feel like anything more than excerpts out of context. They don’t acquire a sense of having much of a beginning, middle and end of their own. Both bits are also directed and adapted by low, using actors who do good work later in “A Common Night,” so the fact that the whole thing doesn’t land better is perplexing. Jenna Papke directs the staging of Carroll’s “The Hunting of the Snark” with a frosting of masks and Commedia dell’arte but despite the cast’s best efforts, the thing never really takes off. It’s puzzling, because the Snark is a fun poem. It may just be that the unrelenting cadence of the thing is wholly resistant to staging in even a semi-realistic manner. It works on the page but not on its feet. 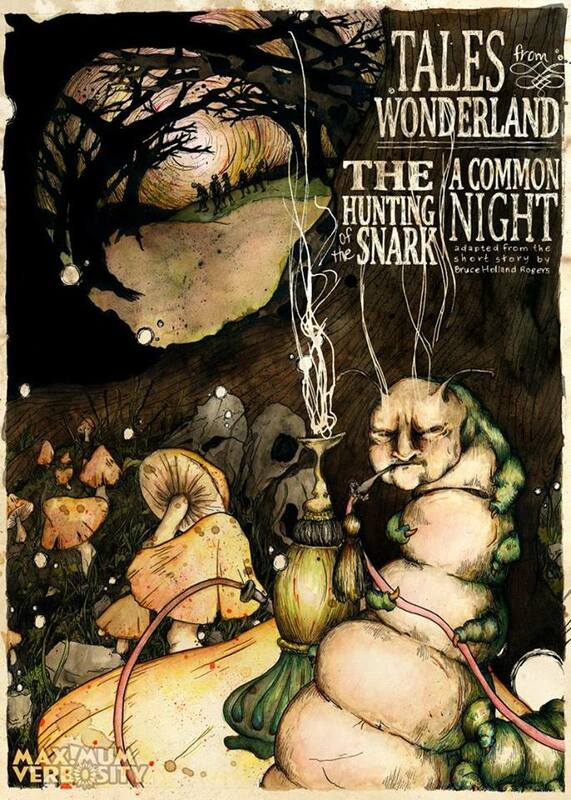 “A Common Night” by itself is worth the price of admission to Tales from Wonderland. (And their tickets are pay what you can, so you can decide the price of admission for yourself.) There’s just a lot of Lewis Carroll between the start of the evening and “A Common Night.” If that’s your thing, you’re in for a fine night. If you’re like me, you kind of want low to ditch Lewis Carroll and instead do a whole evening of channeling Bruce Holland Rogers channeling Lewis Carroll instead.